Three years ago, my husband and I sat down to discuss our future. A dream we had before we met was to build a home and own a decent amount of land. We talked for days working out what we saw for our future, and decided that we wanted to start a homestead. Our idea was to live off of the land, but in a modern way. We still want to live on the grid with electricity and running water. After researching what it truly means to have a homestead, I discovered that many people start a homestead for the same reasons. I am not sure if you are thinking about homesteading or not, but I do think you should consider it. Our reasoning is simple; simple enough that I think you will find a way to start your very own! The meat and produce you buy in the store does not come with a list of things that were used on the product to get it to the market. You do not know what antibiotics, pesticides, herbicides, etc. were used to grow your food. Even things labeled “organic” are only required to be 85% organic. Instead of guessing what it took to create store-bought food, you can grow it yourself. Being in control of the antibiotics, injections, feed, pesticides, herbicides, and anything else you can think of really gives you the control to grow things according to your standards. Animals and plants do not need all of these commercial products to grow healthy and create a large yield. It takes a little work and research to determine the best route for your homestead. With all of the costs that it takes to grow industrial food, groceries can be rather expensive. By purchasing plants as seeds and growing them, you save TONS of money! Preserving your food enables you to enjoy these foods long after the growing season is complete. Purchasing produce and meat no longer become a weekly item on your grocery list, which saves a lot of money! It also makes menu planning simpler, because you have an inventory of fresh produce in the garden and meat in the freezer to shop from first. You only need to shop the grocery store for things you lack, which probably is not much! Not that anyone needs a reason to enjoy nature, but it does help prevent lazy indoor days from occurring too frequently. Getting outside, in the sunshine, provides a lot of vitamin and mental health benefits. Working outside more also gives you a good workout that you cannot get from a gym. The natural energy that springs from working in the garden, being in the sunshine, and chatting with the animals does far more for your health than you can imagine. I have always loved animals! Ole McDonald Had a Farm was my favorite song to sing as a child. I wanted pigs, goats, cows, chickens, horses, etc! Having the space to care for whatever animals we chose to get for our homestead was a high priority for me. Now that we have chickens and cows, and had pigs, I cannot imagine life without them. Their personalities are so fun and unpredictable. If I am having a bad day, I walk out to the chicken coop and talk with my chickens. Crazy maybe, but it definitely helps! 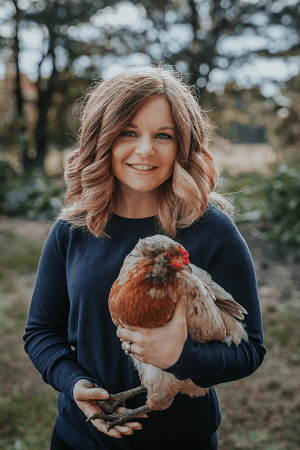 The best part is that each animal has a purpose on our homestead, whether it is to lay eggs, provide meat for our family, or watch over our homestead. Many of our animals our pets, but they all have a purpose to serve with us on our homestead. Some will be here until the day they die, and others will provide for our family. This one came as an “added bonus” for our homestead. The more we have simplified our lives, the more we have found ways to reuse or repurpose things we already have. For instance, canning jars make great water glasses, so if they are not being used for one, they are used for the other. Lint, toilet paper rolls, and all paper/cardboard boxes are needed as fire starters and our compost. The biggest thing I have found to be effective is keeping in mind how many different ways you can utilize things. A 5-gallon bucket is not just a feed bucket. It can be used for watering things, collecting vegetables, a water spout cover, tool holder, etc. So instead of having 15 buckets to serve us in one way until it is no longer useful, we have about 4 that serve us how we need. My husband is great at making things by welding, so many scrap pieces of metal get repurposed for so many things. He has made an aerator with scrap pieces that works like a charm! We saved a lot of money by using what we already had, instead of purchasing an aerator. Believe it or not, there are a lot of basic skills that I do not know. For example, does someone want to teach me how to sew properly?? The idea of tedious work, such as sewing, sounds dreadful. However, the money that we save by mending clothes or a blanket are par none to replacing it with something new. Another skill I am learning more about all of the time is landscaping. So many people think of landscaping as second nature. The idea that I can do that one day excites me! Not to say that we ever learn it all, but it would be nice to become an “expert” at growing and cultivating different plants. Baking skills are something I lack altogether. My sister loves to bake, and I hope that I will someday. If I am ever successful at growing fruit, I hope it gives me an excuse to fall in love with baking from scratch. I doubt I will learn otherwise, because the grocery store has been there all this time, and I have yet to feel its pull. Leading off of the baking skills, the primary reason we chose to become homesteaders is to become self-sufficient. Learning how to live off the land, and not have to rely on others sounds like a wonderful thing! Of course, we need family and friends to count on, but more so for emotional support. We both want to shop our homestead for food, make things from scratch [food and other things], and reduce our carbon footprint. My husband is an incredible man that has encouraged us to progress into becoming self-sufficient. While we know it is a journey to become self-sufficient, he is definitely confident that we can get there. If it was not for my husband being so fearless, we would not have advanced towards our dream lifestyle so quickly. Now that we have taken the steps to purchase land and have gained a few years under our belts, I am the one pursuing fearlessly. Our garden this year is going to be magnificent! I cannot wait to get things planted and growing! Spring is definitely my favorite time of the year, when it comes to getting outside and seeing what we can do to move ourselves even closer to being self-sufficient. If you would like to know about my garden plans or any further details about things shared here, let me know below in the comments! I love sharing about our homestead journey – the good and the not so good! I would love for you to continue posts like this!! Yay!! I am so glad you enjoyed it, Katherine! It’s my husband’s dream to start a homestead! Our first step is to try to buy some land in the coming years. Marette, that is so exciting! I can see that for your family, because of how much time y’all like being outdoors and going on adventures. My husband and I have a lot of the same reasons for our desire to homestead. We are currently in the suburbs and implementing as much as we can, but we are hoping to purchase a home with a decent amount of land within the next few years so we can start living the dream. I wish we would have done a better job at attempting to homestead while we had a smaller land space. It makes it easy to get into it slowly. I have a horrible habit of getting too excited about a lot of things at the same time. haha! In fact, my garden is going to end up being 3 times the size I originally intended, just because I have the space. Cherish learning as much as you can in your smaller space. It will make your transition much easier, and you will have a better idea of how to expand. We have just under 20 acres. Would love to here about your garden plans! Oh good!! I am so happy to hear that, Lucia!